1909 South Melbourne jumper – Garage Dusty Exciting Car Team! 2009 is the 100th aniversary of the South Melbourne Football Club’s first VFL premiership. 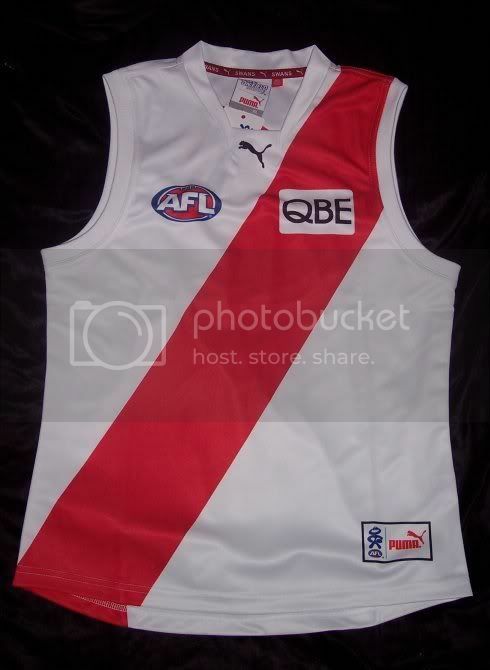 To commemorate the occasion, the Swans are wearing a replica of the 1909 jumper in their 2 games against Carlton this year (the team we beat in 1909). I’ve wanted one of these for years, so when I saw they were being released I went and ordered myself one. It arrived today! Woo. It joins my “normal” South Melbourne jumper (white with a red V), 2005 premiership jumper and current training jumper in the rotation. If I get 2 more I’ll have 1 for each game in Melbourne each year! I also have a late 90s Ansett Cup jumper tucked away in the collection but that rarely comes out these days. ← Why does God let bad things happen to good cars?